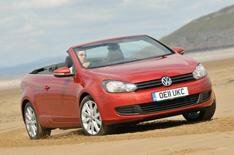 VW Golf Cabriolet 2.0 TDI review | What Car? The Golf Cabriolet is a soft-top version of VWs class-defining Golf hatchback. Weve driven it before with 1.4-litre petrol and 1.6-litre diesel engines, but VW has now added a lower-powered 1.4-litre petrol model and the 2.0-litre diesel that were testing here. Whats it like to drive? The 2.0-litre diesel in question is the 138bhp unit thats available in a host of VW Group cars, including Audi's A3 Cabriolet. In the Golf Cabriolet it rumbles a bit when youre driving around town and feels surprisingly lethargic at low revs. However, it comes alive when the turbo kicks in and is both flexible and quiet at motorway speeds. Our test car was a GT model, and this comes with lowered suspension that makes the low-speed ride a bit too firm. The pay-off is tighter body control on twisty routes, but the fabric roof means rigidity is slightly compromised compared with the Golf hatch, and agility suffers. What is it like inside? Just like the Golf hatchback. The dashboard is classy and well laid out, and theres plenty of seat and steering wheel adjustment available. Its a pity rear visibility is limited with the roof up. Theres room for four six-footers in the cabin, but when the roof is down theres a lot of bluster in the cabin unless you put the wind deflector across the rear seats. The 2.0-litre engine is available with SE and GT trims, and these both bring a DAB radio, Bluetooth, parking sensors, cruise control and a fully electric roof. Should I buy one? The 2.0-litre diesel engine in this Golf Cabriolet is smoother than the 1.6-litre diesel, but it isnt as flexible as you might expect. If you can afford the higher running costs, the 158bhp 1.4-litre petrol is far more likeable; its more powerful, refined and fun, as well as cheaper than the equivalent 2.0-litre diesel.